See Sydney in 4 hours between flights! As if to make up for being half an hour late, our baggage emerged almost immediately after we disembarked at Sydney’s domestic terminal. I’d been SO looking forward to this long layover because nothing does it for me quite like sitting in a large airport with nothing particular to do, nowhere particular to go and no chance of transferring to an earlier flight. But my fantasies of spending the 4½ hours between flights sampling the delights of the airport terminal were about to be cruelly dashed. ‘Why don’t we catch the Airport Link train to Circular Quay?’ Pilchard asked. What? Was he seriously suggesting we leave the exhilarating architecture, stimulating entertainment, complexion-friendly air-conditioning and gourmet treats of the airport terminal behind for the – gulp – unknowns of the REAL world?? The bonus of flying the 2nd leg of our journey with Qantas meant we could check in our baggage up to 6 hours before the flight. So faster than you could say ‘bag drop’, we were buying tickets at the Airport Link railway terminal 2 levels below. 5 minutes waiting for the train, then 6 stations and around 20 minutes later we emerged from the railway tunnels into a warm, sticky and unmistakably Sydney day at Circular Quay. Correctly referred to by pedants as Semi-Circular Quay, its original name and a far more accurate description! But if we’d had ANY doubt about where we were, THIS gave it away. So, instead of the thrill of watching airline passengers scrabbling for luggage at the carousels and their pointless rush to be first to board the plane we instead watched a line of thrill seekers, small as ants getting up close and personal with the Coathanger as they crawled up the massive span of THAT bridge bi-secting the harbour far, FAR – actually 141 metres – below! Pilchard vowed to join them one day. I vowed that on that same day I’d be his official photographer. From our vantage point under the shade of Jørn Utzon’s world-famous shells (or sails, depending on your point of view), the light reflecting from the 1,000,000+ Swedish glazed white granite tiles with which they’re covered, we watched the endless stream of boats, yachts and ferries miraculously avoiding collisions as they criss-crossed Farm Cove and the harbour beyond, before sailing under the bridge or into the quay. Colour, life and movement flowed in all directions – the bright RED of the Royal Botanic Gardens tourist train skirting the green lawns sweeping down to the blue-green waters of the harbour; the mirrored windows of skyscrapers behind the Quay reflecting the scenes below; the massive bulk of a cruise ship against the stonework of the buildings behind; the constant stream of what would be 150,000 vehicles crossing the bridge that day below the climbers above the gray steel struts supporting the bridge’s 503 metre (1650 feet) long arch; the multicoloured ferries coming and going at the Quay; and the multitude of people – sightseers, school students, workers, joggers, backpackers, staff – thronging about the attractions. 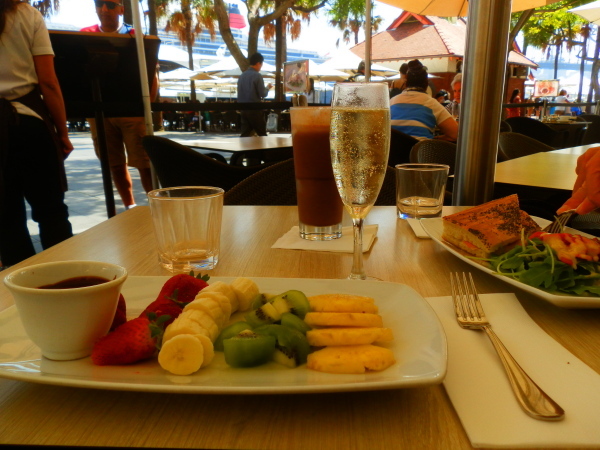 Making do with lunch – platter of fresh fruit (chocolate dipping sauce on the side) and glass of bubbles for me; toasted sandwich and REAL chocolate milkshake for Pilchard – from harbourside eatery the Guylian Cafe, we sat overlooking the fabulousness of Sydney Harbour. A billion dollar view that cost us only $55 (1 x Adult Return Fare @ $34; 1 x Senior Return Fare @ $21) + lunch. And although our wait time at the airport included a sighting of the rare Lavatory Truck (above and below), somehow its attractions just couldn’t compete with that AMAZING harbour. Our micro-tour of Sydney was SO cool, we’d actually consider planning an even longer layover next time! But for now, we had a plane to catch! 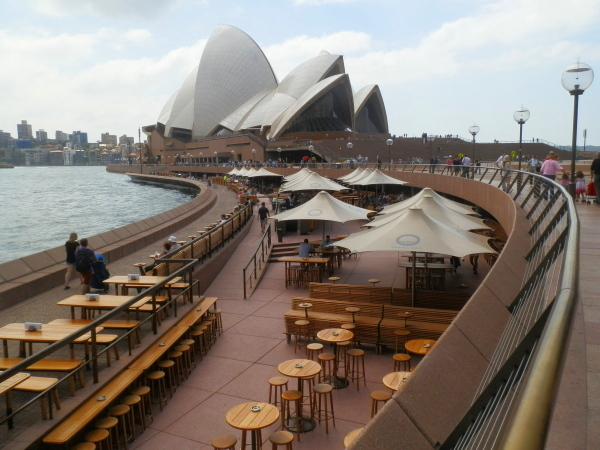 We spent about 2½ hours travelling to and from the airport to Circular Quay, walking around the Harbour Precinct, dining harbour-side at the Guylian Cafe and admiring the Opera House and Sydney Harbour Bridge. It beat the hell out of hanging around the airport for that same length of time! Like the idea, but want to try something different? For Sydney Harbour up close, take some extra time and Hire a Boat – or even a luxury yacht – and explore the harbour at your own pace! There are MANY other attractions – see below – and if your layover isn’t long enough to see them all, why not consider extending your stay?! Get started by checking out some cheap flights – but don’t make that layover too short! Airport Link connects Sydney’s International and Domestic Airport Terminals with the rest of the city via rail. Well … we COULD have been watching THIS at Sydney Airport instead! Aussie ABC: O is for Opal! Airport link trains are fantastic and so is the ability to check luggage up to 6 hours before your flight! Hong Kong has an excellent airport train service called the MTR, in case you are ever passing through and have a decent layover. Thank you for sharing the Sydney highlights – you made the most of your layover! Thanx for the tips about Hong Kong, Nancy! Always good to know you don’t have to waste hours of your life in the airport!! Wow exploring a city in 4.5 hours layover is incredible! I love productive layovers (mine usually aren’t :p) The Sydney Harbor Bridge looks amazing – I’ll probably try climbing (just probably). Hope to revisit Sydney soon! I’m so glad you managed to get out of the airport and into the city for a quick look around, you’ve managed to catch most of the sights here and caught a good day to see it all too. I climbed the bridge one year for my birthday, it was hairier than I reckoned on but I managed to complete it. Not sure if I’m brave enough to climb the bridge, Anna – but I’m certainly brave enough to take pix from the bottom!!! I think people underestimate their ability to experience cities during a layover – Sydney is a great one with such a quick and easy airport link to the city. Sure, it may not be a great deal of time, but you can definitely get a taste for the city in a couple of hours, and as you said, definitely beats the airport! So glad you had the chance to explore the harbor – definitely a way to throw some excitement inbetween connecting flights! I’m usually WAY too paranoid, Meg – but this was our 2nd time in Sydney airport in a week, so I would have rather drunk my own pee then stayed there for another 4 hours! The only problem was that once we got out there, we wanted to hang out in Sydney for a bit longer instead of going home! I would never leave the airport for 4 hrs but great to see that you had a great time. I have had some bad experiences in connecting airports. I even stayed put for at the Kuala Lumpur Airport even when I had a 9 hr layover. I’m usually totally paranoid about these things, Gokul – but the worst thing that could happen to us was to miss a domestic flight back home to Adelaide and have to stay overnight, so no big risk. This is such a good stopover guide! I’ve never been to australia but this is great information! Well, you’ll know EXACTLY what to do even if you’re just passing through, Victoria! That is the best utilization of layover time. So much in so less time. Sydney is one city I am craving to tour. These possible visits in such a short time is very encouraging. Great read and idea! I’ll be traveling from the US and will have a 5 hour layover in Sidney. Does anyone know if I’ll have enough time to make this trip? Trying to account for customs, TSA lines, etc. Hi Amelia! So sorry for the delay in replying – there ARE some parts of OZ with no Internet access!! I really DID do the trip from the airport to Circular Quay, saw the Opera House, Bridge and some of the Botanic Gardens, had a light lunch AND returned to the airport in about 2 1/2 hours. We could have spent a little longer on any one of those parts of our jaunt, but we were too paranoid to be late for our flight. I don’t know how long it would take you to get through customs in Sydney, but if it’s less than 2 hours, then you WOULD have time to do what we did. But PLEASE double check the airport train times – we did our jaunt in the middle of the day when the train ran every 15 minutes – it may be a bit less at other times of the day. Enjoy your trip! The Bridgeclimb really isn’t scary once you get going and is definitely worth it. But here’s a tip re: the very expensive airport train – walk the 1 km from the airport to the Mascot train station and your return fare to Circular Quay is then only $6.76 for adults and $3.38 for seniors. Thanks for the tip, Sandy! That’s a massive saving – 1 km (10-15 mins) is a small price to pay 😀 With a short stopover like ours, we’d have to think carefully about the slightly longer time it’d take, but that would add another dimension to the stopover, haha! Loved this Red! So many times I’ve sat at airports watching baggage handlers, and breathing in stale air while waiting for flights and wriggling my toes. You’ve energised me to get out if only for a short while. Your pic of the peeps on the ‘coathanger’ is memorable – me too, reckon I’d be the photographer at ground level, although I’d hate myself for it! Grace, for an afterthought, this mini tour worked out splendidly – but it DID make us realise how long since we’d had a serious stay in Sydney. Try over 20 years – AAAARRRRGGGHHHH! I used to live in Sydney, but I NEVER got over the thrill of crossing the Bridge by train – seeing all the other commuters around me reading the paper while riding through the most spectacular landscape always surprised me. Maybe we’ll see you there one day??!! That bridge walk looks like my kind of fun. I don’t think we have that here. Too many lawyers. It’s a crazy but interesting place, Red! Haha,Lizzy! ‘Crazy’ and ‘interesting’ aren’t mutually exclusive – are they?!?!?! You really can squeeze a lot into four hours in Sydney! I might be a little biased, but I do think it’s one of the most beautiful cities in the world. I’m not one for cities so much, Yum – but you’re right! There IS something special about Sydney!! Sydney Harbour on a budget and in A whirlwind? Awesome!! Seeing that bridge is pretty amazing isn’t it? An icon. When we visited Sydney years ago, it cost $100 each to “climb” it. We didn’t budget for that, so didn’t do it. Has the price increased much? Great photos of a vibrant city. I’d forgotten how cool the bridge and the opera house are up close, Vicki. But you’ll have to ask a braver person than I about the bridge climb cost – I didn’t even consider it, coward that I am, and didn’t think anything of it until I saw the climbers silhouetted against the sky!! When I can get a glass of quality bubbles with a fresh fruit platter complete with chocolate dipping sauce at the airport, then MAYBE I’ll change my tactics!!! What a unique way to see Sydney! Only you could make a four hour layover so thrilling and adventurous! …But I’m not walking up that bridge, either! It’s amazing how much you can do in Sydney in such a short time, Denton – we could have spent another 30-45 minutes exploring and still made it back with loads of time. Glad you like the bridge shot – the real thing is even better!! Your lunches look so delicious! One day I’m going to be one of those ‘ants’ up on the bridge. Anything involving chocolate and sparkling wine works for me, River!!! I look forward to seeing you way up high one day – but I’ll be the one with my feet firmly on the ground, even if I take Anne’s advice and do the Pylon Museum climb!! Great idea Red. Don’t you just hate hanging around airport for hours on end? I really love Sydney and the Circular Quay area. It always bedazzles me. It’s AWESOME, Kathy!! We had a shorter stopover of a couple of hours on the forward journey that bored us witless, so we decided to do SOMETHING on the return trip with a longer gap between flights. It would have been money well spent even if we’d just gone to the Quay and back again without wandering around – but next time we’ll know exactly how long we can spend! Red, it is great you exited the cocoon of the airport to spend a little bit of time in my current home city! The train really is quite convenient so there was really no excuse not to do an outing. 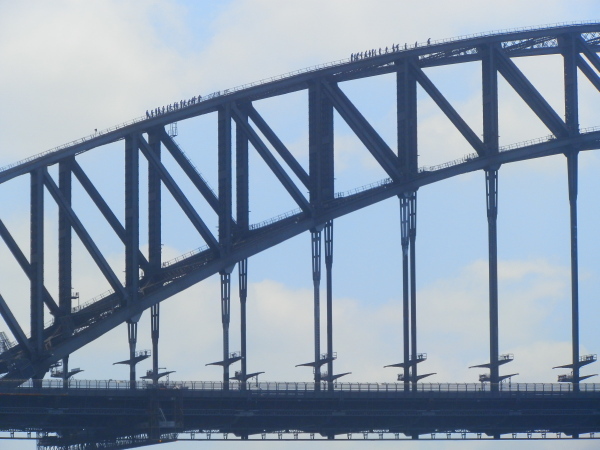 If you would like a closer view of the top of the Sydney Harbour Bridge, Sydney Harbour itself and the climbers (without having to actually climb up it yourself) then next time I suggest you walk the vast ~500m distance to the Sydney Harbour Bridge Pylon Museum – you pay a fee, go up the steps and there is a great view from the top. And you can actually take your camera (unlike the Harbour Bridge Climb). Maybe on your next stop over in Sydney…. I’d have been in touch if I’d known we were going to spend time out of the airport, Anne!!! I was surprised at how quick and easy the service is (despite the expense) – we could easily have had another hour and still made it back in time for our flight, but we were WAY too paranoid for that!! Thanx for the tip – the Pylon Museum sounds like a great option for us scaredy-cats!!! Have a great weekend, my friend! I really, truly love the amazingly beautiful harbour of Circular Quay!! But I found things that I didn’t know. Welcome back from the outback, Red – but you are flying to your next destination. Anyway, thanks for sharing your fantastic 4 hours in Sydney. I enjoyed this post so much!! It’s nice to share a NON-Outback adventure, Kozue!! Even if it only lasted for 4 hours 😀 It’s rare for us to fly, and even rarer to have an inner city experience but it was so enjoyable I think we’ll be back for more!! The harbour was amazing – we only wished we’d had time to catch the ferry somewhere interesting. Maybe next time we’ll plan a 12 hour layover!!! Pilchard was hoping for a penguin sighting, Chris – but they were a no-show in this part of the foreshore!! Sydney is such a dynamic city – can’t wait to go back for more exploring!! Such a surprise to not see some red dirt in your post. Especially so as we are in Sydney now. Slowly concessions have been made and for some the cost of the airport train has dropped but the outrageous basic full price has not. Haha, this is one of my occasional forays into the Big Smoke, Andrew!! Can’t believe you’re also in Sydney – how weird would it have been to accidentally run into each other THERE of all places?? Perhaps we did 😀 We ended up treating the $55 (for two) the Airport Link cost as if it were a tour. If we’d stayed in the airport, we’d probably have spent $100 on food and magazines to alleviate the boredom anyway!!! Now you have brought back memories from 2006 – I was one of those ants up on the bridge. What? You mean you’ve had an Aussie experience I HAVEN’T had, Glen?? Next thing you’ll be starting up a blog of Aussie adventures to rival mine!!! I’d be scared witless up there on the bridge – but I’m looking forward to planning a few longer layovers so we can do some more exploring! !